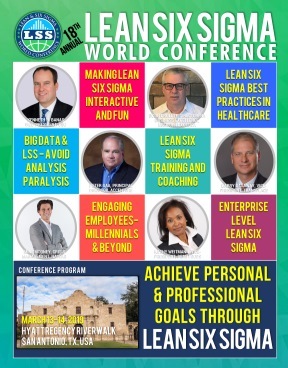 The Faculty will introduce the audience to what is regarded often as the “missing ingredient” in Lean Six Sigma deployments, which is embodied in an understanding of the role that Emotional Intelligence (“EQ”) has in Lean Six Sigma deployments and, indeed, any change management initiative in an organization. This program will take the audience through an understanding of the role that emotionally intelligent leadership plays in effective deployments, both at the leadership level and practitioner level. Case studies will be shared that illustrate the empirical process pioneered by the faculty to predict, in advance, the likelihood that a candidate will succeed in embracing and effectively practicing the Lean or Six Sigma methodologies. Similarly articles published by the Faculty on this topic will be made available for purposes of educating internally once the participant returns to their organization. In addition to this important foundation, the program will share results of a research study conducted by the Faculty that forecasts the status of the industry today in terms of what we regard as the three essential requirements for sustained improvement capability: Commitment to Lean and Six Sigma methods, Emotionally Intelligent Leadership, and Project Portfolio Management. A recently published white paper will be shared with the audience and this will serve as the springboard for which the deep-dive into EQ will occur. At the end of this presentation, participants will be able to immediately identify how well they compare with research study participants, and what gaps may exist in their own organizations with respect to the three essential requirements for sustainable improvement capability. Moreover, they will leave with a good understanding of how to begin the process of introducing methods that foster emotionally intelligent leadership, and how to dramatically improve their ability to get the right people on the bus, from leadership down to the practitioner level.